THE TEERITZ AGENDA: Friday 5/8/16 - Rush, Rush, Rush & This Week's Wristwatches. Friday 5/8/16 - Rush, Rush, Rush & This Week's Wristwatches. This 1951 SM2 is a very nice machine to use. And I'm a sucker for 3 x 5 cards. See that nice Lyra pencil with the tiny bite marks on the end? There's a photo of the culprit. Who could not care less about a pencil. Lately though, I'd been thinking about getting a metal bracelet for this watch. There are a handful of Omega bracelets that will fit this watch. In fact, some modern Omega bracelets are designed in such a way that they will fir this watch very, very nicely. Given that the case dimensions of this 300 are virtually 100% identical to those of the Speedmaster, the bracelet of the Speedmaster will fit the Seamaster perfectly. However, I didn't want to put the Speedmaster bracelet on the Seamaster, so I began hunting around eBay for an aftermarket bracelet that would fit. There are plenty of them out there, but it would be a slight gamble. I have heard tell from other watch nerds that the fit of these generic bracelets is not exact. This gave me reason to pause. 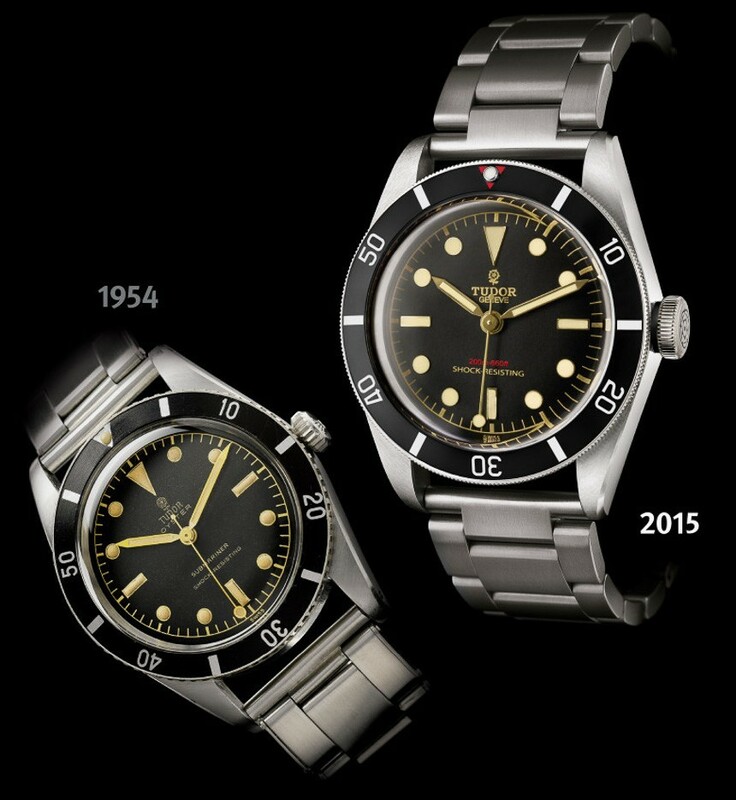 The one on the left is the original 1950s Tudor Submariner, which was released a year after the classic Rolex version. The one on the right was released last year. It was the Tudor Heritage Black Bay One model. The more I looked at the way the bracelet joined the case lugs, the more this particular look began to grow on me. So, I recalibrated my search for something similar to this design and it wasn't long before I found a bracelet that wasn't pricey and would do the job nicely. Also, this kind of design would also offer a point of difference to the other bracelets on my other watches. And that's gotta be good. For the record, the Tudor Black Bay Heritage One model sold for 375,000 Swiss Francs at that auction last year. I ended up finding a Hadley-Roma bracelet on eBay for 27 bucks. The postage cost was an obscene $25.oo. It has an old-style look and feel to it. Definitely rattles more than modern bracelets do. I don't actually mind this at all. Makes it all the more an old-fashioned style of bracelet, like Omega and Rolex used to make. Some folks really hate that gap between the bracelet and the case edge. This is one reason why some collectors don't like straps, because of this gap. I will readily admit that it took me about a day to get used to seeing this gap on a metal bracelet. Now I think it suits the watch wonderfully. Of course, for twenty-seven bucks, you're not exactly going to get the same level of quality that you'd get with a six hundred dollar watch bracelet. That's cool. The links are solid enough, the spring bars are quality-made, and the finish on the steel is nice, too. This band will do just fine for now, and it'll give me time to decide if I really want to go for an original Omega bracelet for this watch. And that's this week done, gang. This post was titled 'Rush, rush, rush'. It's been a busy couple of weeks at work. We have been slightly short-staffed this week and I've been coming home tired and still staying up later than I should, avoiding absolute garbage on TV, as evidenced by the TV guide above. So many channels. So much crap. Yep, time to get back into reading. Ted, you should have no trouble finding a generic-brand stainless steel bracelet for that watch. eBay is your friend here. That looks great. I've never noticed the gaps between straps/bracelets and the case. In fact, I went for years without noticing until watch forums came along and people started pointing it out. I still don't notice - I just don't look at the gaps when I'm looking at a watch. Generally, the end-links of a bracelet are cut so that there's no visible gap. A straight-cut bracelet like this tends to generate divided opinions among watch nerds. Some of them think it looks like the bracelet was not made for the watch, while others don't mind the look. Truth be told, I prefer my bracelets NOT to have a gap (but this one looks so damn cool! )and my leather straps TO have a gap. I'm no fan at all of curved-end leather straps that sit right against the case. They don't mold very well around my small wrist. Thanks for stopping by, CrookedNose!